This stunning Game of Thrones: 3D Crystal Iron Throne depicts the Iron Throne as shown in the GOT TV Series. Sought after all over Westeros, the possession of this Throne is everyone's dream, from the Tyrell's to the Lannisters. 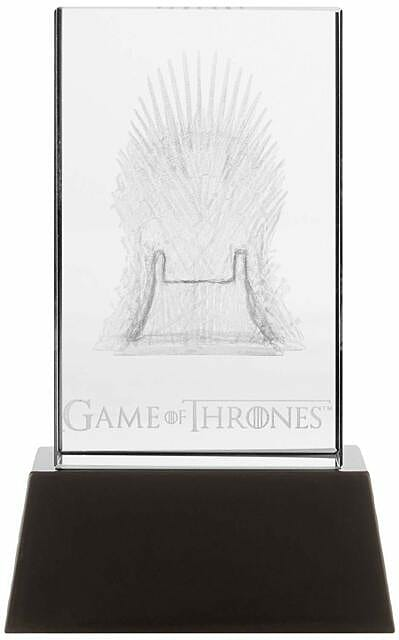 Lit up by a hidden LED light, this piece of Game of Thrones merch will cast a beautiful shadow across the rest of your Game of Thrones collection. 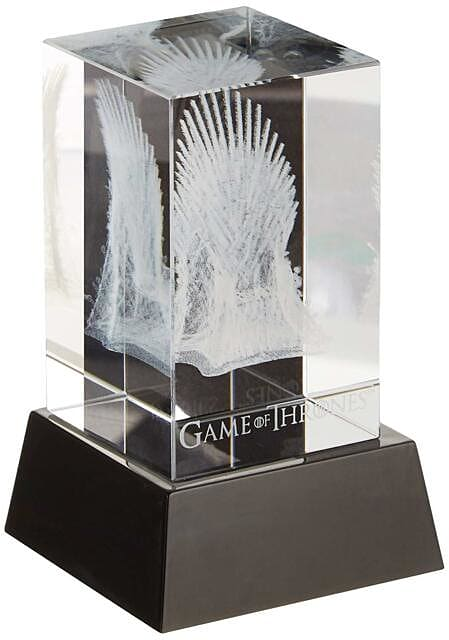 Don't miss out and shop the Game of Thrones: 3D Crystal Iron Throne today, at GAME. The solid glass rectangular box measures 5 x 5 x 8 cm and sits on a discreet black base with a hidden gold LED element. The stunning effect is best viewed in person. One of the most-anticipated items by retailers and fans who saw the prototype at conventions and trade shows.